Entrepreneurs for Water disinfect open wells for free. Now let’s work together and see how we can solve the issue. People need water and will have to use the water that is available to them. Reality is that not everybody has pipeline water and many simply depend on open wells even in town. 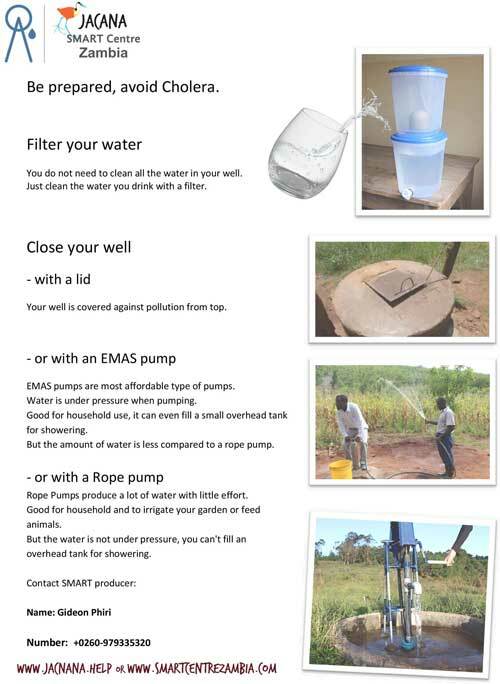 SMART producers (who produce affordable water solutions in Chipata) went around last week in Chipata town and disinfected open wells in many households for free. Explaining that although the service is free today, chlorinating open wells is not a sustainable solution. If a well or borehole has been infected, it will most probably be infected again after some time even if we clean it today. Recently there came affordable solutions on the market to improve your well and make sure your drinking water is safe, see picture. Next week the SMART producers (meet them here: https://jacana.help/water) will continue their free service and go from door to door in Chipata town.